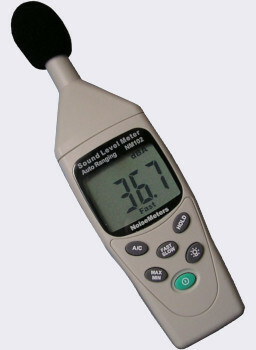 This sound level meter is available for hire for periods of one week or longer. As a basic (not integrating and not calibrated) meter, it is intended for basic noise measurement where the regulations don't demand anything more. The NM102 is a low cost noise meter for basic surveys and sound level checks. It has many features, such as Fast and Slow time response, A and C frequency weighting and Max/Min measurements. The backlight makes it ideal for use in low-light environments. While the NM102 is an accurate and full-featured sound level meter, it is not provided with a traceable calibration certificate and so is not suitable for measurements to be used for legal purposes. Please see the Applications tab for more information. The NM102 covers a wide range of measurements, auto-ranging from 30 to 130 dB(A). The NM102 Noise Meter has been designed to be quick and easy to use. The auto-range feature means that you do not have to select the measurement range before making measurements, which is a problem with most sound level meters. With this meter you just switch on and it starts measuring the "A" weighted, Fast Sound Level, which is ideal for most applications. Fast/Slow Switches between Fast time weighting and Slow time weighting. For more information please visit our Time Weightings page.